Lewitt’s latest mic is so quiet that its noise floor is below the level of human hearing! But what about the sound you can hear? It seems that Lewitt CEO Roman Perschon looked upon the development of the LCT 540 Subzero cardioid-pattern mic as something of a personal challenge. While the LCT 540 designation has appeared before, this latest incarnation, we’re told, was designed in response to feedback from Lewitt’s various endorsers, where the brief was to keep compromise to the absolute minimum while not allowing the price to become astronomical. The Subzero part of the mic’s designation relates to the fact that its equivalent electrical background noise is below 0dB SPL (see box). 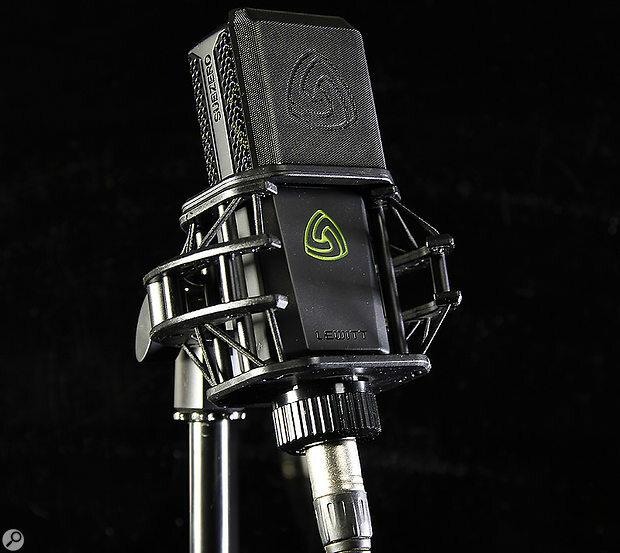 The microphone has a cast zinc body and a perforated coated-steel grille, and follows the satin-black and green-trim styling used on other Lewitt mics. The overall size comes in at 158 x 52 x 36 mm. The signal exits on an XLR with gold-plated pins, and the XLR ‘neck’ is gripped very firmly by the rotary clutch mechanism of the included custom shockmount. Also shipped with the mic is a soft storage pouch, a pop shield that attaches to the shockmount using embedded magnets, and a foam windshield. All this is packed in a beautifully engineered, foam-lined, Pelican moulded carry case fitted with moisture seals. The mic has a fixed cardioid polar response courtesy of an externally polarised one-inch-diameter, centre-terminated capsule skinned with a three-micron, gold-sputtered Mylar diaphragm. Standard phantom power of 48V (±4V) is required for operation. The mic has a dynamic range of 132dB, and its sensitivity is 41mV/Pa, but it can accommodate a range of levels courtesy of switchable pads at -6 or -12 dB, plus its first-order low-cut filter can be switched in at either 80 or 160 Hz to help balance proximity effect or reduce the effect of low-frequency off-mic noise. Each mic is factory adjusted to produce the same sensitivity at 1kHz, so any two should behave as a matched pair. 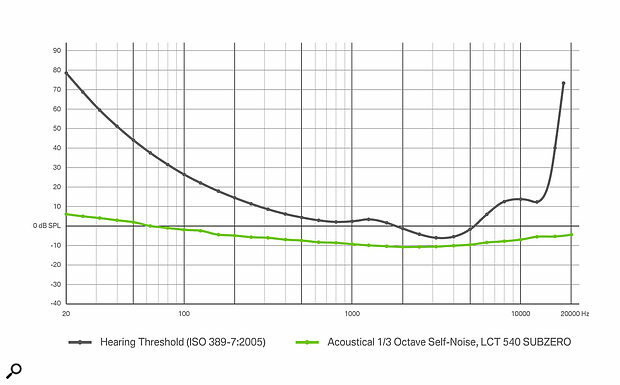 As with most large-diaphragm microphones, the response is engineered to create a specific tonal character, and in this case the presence peak, which rises very gently starting above 1kHz, hits a maximum of just over 5dB at around 12kHz, lending the top end an open and airy quality. As with some of Lewitt’s other high-end mics, the pad and filter functions are controlled using push buttons to step through the options, with a backlit panel showing the current settings. However, the seemingly simple three-switch arrangement employed here accesses some other useful features. Normally the backlighting uses white LEDs, but if the mic should be pushed into clipping, the backlight flashes red. If the ‘Clipping History’ feature has been activated (by holding down the left button for longer than two seconds), then once a clip has occurred, the light alternates between white and red until cleared. There’s also an automatic attenuation mode, pioneered in earlier Lewitt models, entered by holding down the right-hand switch, at which point the indicator LED turns red. The mic can then be exposed to the loudest sound it is required to record during setting up and will switch in the appropriate attenuator pad as soon as clipping is detected. The central button can be pressed and held for two seconds to lock the current switched settings against accidental changes, at which point the backlight behind the logo is turned off. Pressing this again for longer than two seconds unlocks the switch functions. There’s no doubt, then, that a lot of thought has gone into the design of this microphone, but what does it actually sound like? Going by the description I expected it to sound airy and detailed, which it does, but I was also pleased to discover that its detailed highs were balanced by a solid mid-range and supportive lows. Its tonal balance sounded right without the need for EQ in both my male and female spoken-word tests. Of course, different vocalists have different tonalities, so some EQ may be necessary in some cases. That said, because the tonal character of this mic doesn’t lean too far in any particular direction, it should be a good fit for a wide range of vocal styles, with plenty of secondary applications in instrument recording. I always find acoustic guitar recordings to be very revealing of a microphone’s character and here I got back pretty much what I felt I was hearing from the instrument in the room without any unnaturally glassy highs or phasey-sounding mids. As to that impressively low noise floor, in most common studio applications, such as vocal recording, it probably won’t offer a significant advantage over other well-specified but less quiet microphones, as the ambient noise in even a quiet room usually dominates proceedings, but in more demanding situations where the sound source is low in level or miked from a distance in a very quiet environment, it could pay dividends. 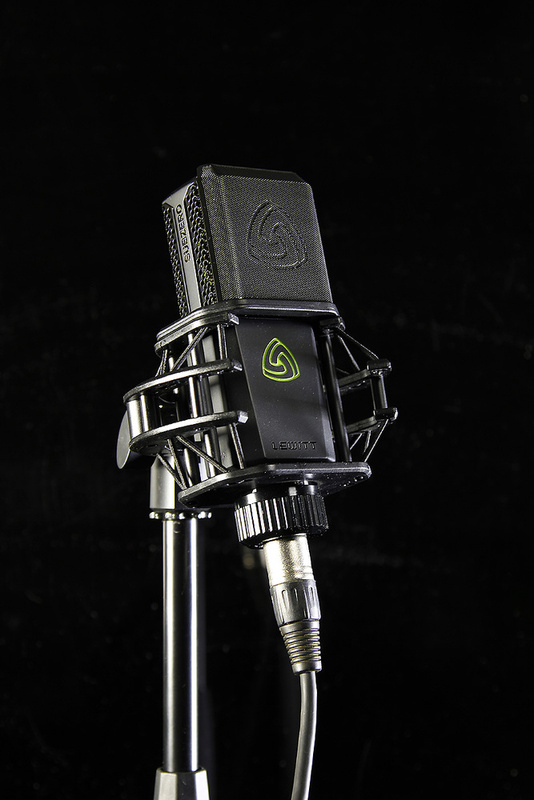 Given that it is a mid-priced mic with a somewhat lower price tag than I expected from its performance, the LCT 540 Subzero represents extremely good value and is capable of taking on a wide range of recording tasks. In this mid-price range, Rode, AKG, Audio-Technica and most of the other ’names’ in microphone manufacture offer high quality models — and that’s before you get onto the smaller boutique companies. The threshold of human hearing is defined as 0dB SPL at around 2kHz, by the ISO 389-7:2005 standard for human hearing — which is based on the results of research institutes around the world that tested the hearing threshold of otologically normal people between the ages of 18 to 25. The LCT 540 Subzero’s electrically generated noise was measured as -1dB equivalent SPL (A-weighted), with the capsule replaced with a capacitor of the same value for measurement purposes, but this figure is only part of the picture. Random motion of air molecules around the diaphragm at room temperature puts the equivalent acoustic self-noise level at +4dB SPL (A-weighted). 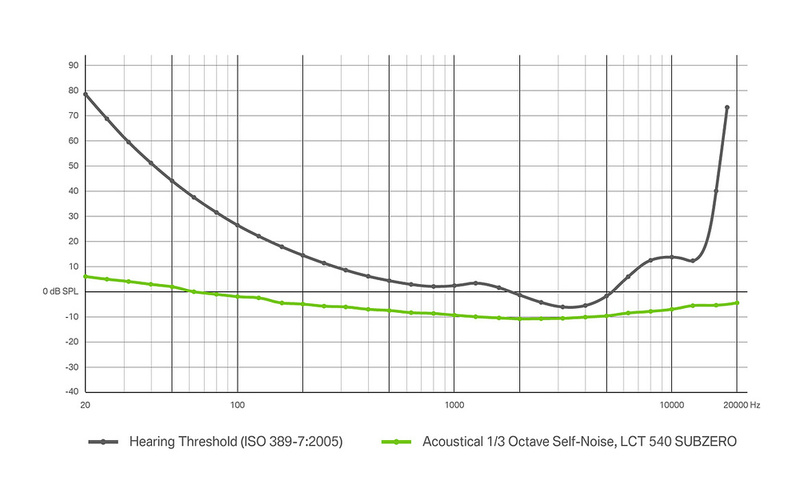 We’re told that Lewitt’s engineers used third-octave measurements according to IEC 60268-4, as simple A-weighting doesn’t take into account the masking mechanisms inherent in the human hearing system. Dual-value pad and filter options. While the mic market is extremely competitive, the LCT 540 Subzero works well on both artistic and technical levels and is less costly than many of the mics it outperforms.